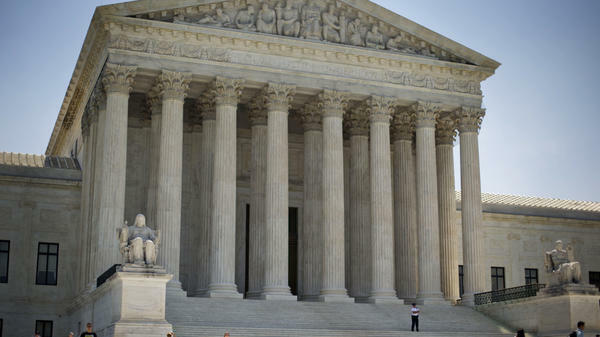 The Supreme Court decision held that health care workers could not be forced to pay fees to the union recognized by the state of Illinois, because the state is not their direct employer. Some fear this will lead to further erosion of unions. The Supreme Court stopped short in its Harris v. Quinn decision this week of eliminating unions' ability to collect compulsory dues from government workers who aren't union members but receive the same benefits. However, the majority opinion written by Justice Samuel Alito left it abundantly clear at least some members of the court are prepared to do just that. In a ruling two years ago, the Supreme Court "sort of cracked the door open a little bit to reconsidering the constitutionality of forced dues for public sector workers," says Patrick Semmens, vice president of the National Right to Work Legal Defense Foundation, which argued the Harris case. "With this case, while they didn't go through it, they cracked that door wide open," Semmens says. Public sector unions have been fighting to preserve perks and sometimes their basic survival in numerous state legislatures in recent years. Now, they worry that their opponents will be further emboldened to attack them in court. Alito's opinion dwelled on the "questionable foundations" of the court's 1977 decision in Abood v. Detroit Board of Education, which set the modern framework for public sector union law. "You now have five members of the Supreme Court saying really for the first time, 'Gosh, we think Abood is kind of on shaky ground,' " says Joseph Slater, a labor law expert at the University of Toledo. But it didn't overturn that precedent, which holds that public employee unions can charge nonmembers "agency" or "fair share" fees equivalent to the amount they'd pay in dues if the unions bargain on their behalf. "If you're not going to overturn a precedent, it's odd to have so much [language] in the decision about that precedent, and to have so much in the dissent about why that precedent shouldn't be overturned," says Randi Weingarten, president of the American Federation of Teachers, the nation's second-largest teachers union. Maybe that's because there weren't five votes to do so, some observers speculate. It also could be why the Harris decision wasn't released until the last day of the court's term — Alito may have been shopping for votes until the end. "They could have overruled Abood here," Slater says. "If they couldn't get five votes for it in this decision, what makes anybody think they'll get five votes, barring any change in the makeup of the court?" That, Weingarten suggests, "makes it clear why elections matter so much." Even barring any change in the court, the majority made it clear it will at least entertain further challenges to public sector unionism. The language of the Harris decision also may lead lower-court judges to frown on compulsory fees. "We've got a number of cases going forward on these issues," says Semmens, the National Right to Work official. The Harris case involved home health care workers who are paid by state governments through Medicaid. The court held that such workers could not be forced to pay fees to the union recognized by the state of Illinois, because the state is not their direct employer. But it did not extend its ruling, as some union officials feared, to keep government employees such as firefighters or Department of Motor Vehicle clerks from being forced to pay fees either. It's possible court conservatives are just waiting for a more promising case. "They're probably waiting for the next teacher out there who doesn't want to pay 'fair share' fees paired with a group that wants to see Abood overturned," says Jake Rosenfeld, author of the recent book What Unions No Longer Do. The public sector has been a rare bright spot for the union movement in recent years. Fewer than 7 percent of private sector workers are unionized, while more than a third of government workers are. But public employee unions have come under considerable pressure in recent years. Many states have rethought pension benefits for their workers, and some have weakened teacher tenure protections. A number of states are considering so-called paycheck protection bills, which would prevent unions from being able to automatically deduct dues and voluntary political contributions from members' salaries. Most dramatically, Wisconsin in 2011 stripped most public employees of collective bargaining rights. With unions no longer able to represent them in major negotiations with the state, membership there has plummeted. Overturning Abood would be a big blow to unions, but it wouldn't go far. Rosenfeld, who teaches sociology at the University of Washington, argues that even if public sector unions ultimately lose that kind of legal fight, they'll still be able to recruit government workers. "It's absolutely true that organized business groups want to see the end of unions in the United States," he says. "But should Abood be overturned, that does not dispel the end of unionism."